Ah Rachael. Beautiful purveyor of mildly sad, “wrist slitting” music. I cannot help but be in awe of her capabilities. To be able to lead a Singer’s lifestyle and still be really quite cool. The concert on a whole had its highs and lows. I throughly enjoyed her older songs from her album Happenstance, and I thought the slightly Rock-ier sound whilst in concert suited the atmosphere, as her album versions tended to be more mellow and more subtle, whilst the big hall needed bigger sounds to fill it. However, one particular moment will stick with me, it was her finale, Reason Why , Ms. Yamagata seemed to have jolted the tempo mildly with this rendition but it fitted the atmosphere of the hall. Everyone seemed mildly amped, and even I could feel the blood rushing at many moments during the concert. I think Reason Why is the quinessential Yamagata song and was alittle disappointed that she did not open the concert with it. Nevertheless, Worn Me Down, Letter Read and Be Be My Love was beautiful, slightly edgier than I remember in her album and honestly did Rachael really need any more edge? This is a really really a mild criticism. I mean who am I to criticise, I guess I just like the mildly melancholic, “wrist-slittin'” Yamagata more. The after concert however is what I will truly remember. I rushed out to the other side of the Esp, ignoring the mild thump of my ankle, and joined the typically Singaporean queue to get albums signed. 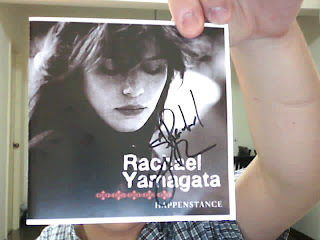 Some god above blessed me with foresight and I lugged my plastic album all the way there, and after what seemed like an eternity, I was up there with Rachael, she was quite possibly the most friendly artiste possible. Telling me about her experience playing the piano for The O.C. and leaving me throughly star-struck. As you can see from below, I’m smiling like I’m mildly retarded, but that is because at that moment I didn’t have full control of any of my faculties. I had rehearsed this line in my head, I think it was ” Hi Rachael, I am a huge fan, and have been since your appearance on The O.C.” I think I must have babbled a lot, and she must have been throughly scared by this HUGE guy. Lol ah well, live and learn. Ultimately this was an incredible concert for me, and its gonna be hard to forget for a while. Previous Post Updates from All Over.